He believes it’s likely to be George Groves or Callum Smith, but says Eubank jr can prove he’s a real contender with victory over Avni Yildirim in their quarter-final clash on Saturday. DeGale knows all about the 26 year old Turk having sparred him – and says Eubank jr could be in for a tough night when he defends his IBO super-middleweight championship. “Yildirim is tough, strong and game,” said DeGale. “He is very, very strong – and he loves it. He loves to fight. “He got in for three rounds, I broke him and he jumped out, but he broke my bridge (of a tooth) in the first round. DeGale says he is back in training following shoulder surgery in June – and should be back in the ring by the end of the year. He expects to announce his next opponent “in the next week or so” – and says he wants the winner of World Boxing Super Series. “The final is supposed to be in April or May next year,” said the 31 year old southpaw, “and I could fight the winner next summer. “It’s tight, but I think one of three Brits will win it. I’m favouring Smith or Groves at the moment, but Eubank is coming up on the outside. 4 nights of action and the World Boxing Super Series has only just begun! The first contest of the World Boxing Super Series was the cruiserweight quarter-final between WBO World Champion Aleksandr Usyk and Marco Huck at the Max-Schmeling-Halle. Ukranian Usyk retained his WBO cruiserweight title and moved on to the next round of the Ali Trophy tournament by stopping German Huck in the 10th round. The Olympic gold medalist from London 2012 forced his German opponent backwards and dominated with his power throughout the fight which proved why the number one seed is the tournament’s favourite. In addition, the Ukrainian got new fans all around the world with his charisma inside and outside the ring. Hometown hero Callum Smith claimed a hard-fought victory at the Echo Arena over Sweden’s Erik Skoglund to advance to the semi-finals. Smith dropped Skoglund to one knee in the 10th round and scored a unanimous 116-112, 117-110, 117-111 on the judges’ cards. Skoglund, the previously unbeaten Swede, threatened to cause an upset in the early stages of the contest, but Smith managed to ride out the storm. With a combined 41 knockouts over 42 victories, Yunier Dorticos vs. Dmitry Kudryashov at the Alamodome promised an all-action fight. In a fight between two KO artists, Cuban Dorticos showed that he mastered his skill better than his Russian opponent. The WBA World Champion proved that he is a dangerous challenger for everyone in the tournament when a perfect right hand sent Kudryashov crashing to the canvas in round two. Kudryashov was counted out and Dorticos lived up to his nickname: ‘The KO Doctor’. 10.000 ecstatic fans at the Arena Riga got what the came for: A victory for their hero, WBC World Champion Mairis Briedis when beat Cuban Mike Perez (22-3, 14 KOs) by a 12 round unanimous decision in a very competitive fight. The judges scored the fight 116-110, 115-111, and 114-112 and paved the way for an explosive quarterfinal: Usyk vs. Briedis! 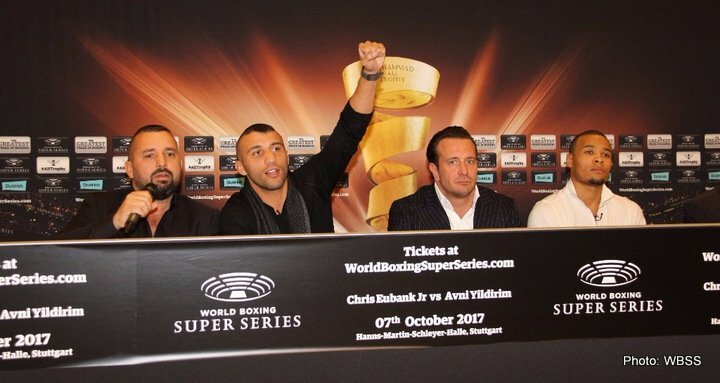 On Saturday the fans in Stuttgart’s Hanns-Martin-Schleyer-Halle and the viewers around the world will experience the signature rock song connected to the World Boxing Super Series, ‘The Future is Now’, when Jesper Binzer performs the song live in the ring just before the Ali Trophy quarter-final between Eubank Jr. and Yildirim. “I am looking very much forward to this experience,” said Binzer. “I am fortunate to have many fans in Germany where I have been performing many times with my band D-A-D. Being in Stuttgart at an Ali Trophy quarter-final is huge for me, and I hope the song can turn up the excitement even more before the two fighters face off in the ring,” said Binzer. Binzer, who remains a part of the famous Danish rockband D-A-D, made the song as part of a solo project. “I know one of the tournament organizers and when he told me about the World Boxing Super Series project it just struck me,” said Binzer. ‘The Future is Now’ first featured at the Draft Gala in Monaco in July when all 16 star boxers came face-to-face. Tickets for the Ali Trophy quarter-final bout between Chris Eubank Jr. and Avni Yildirim in Stuttgart are on sale ranging from €21 to €250 at StubHub.de , eventim.de and easyticket.de.